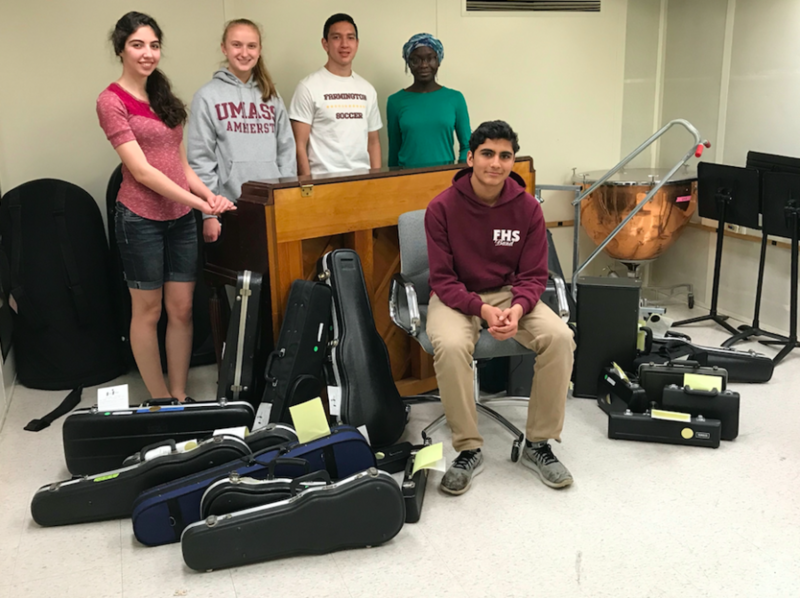 Music to our ears -- Juniors Rohit Limaye (front), Praise Adeloka (left), Kevin Gabree (center left), Anita Ghodsi (right), and senior Sarah Rahmig smile for a photo with some of the instruments obtained by the recent musical instruments drive. The project, spearheaded by Limaye, collected 30 to 40 instruments, which will soon be distributed to elementary-aged students. room, was designed to ensure that young musicians are able to participate in school music programs in spite of financial limitations. Limaye has been working with the Music Department on this project in the hope that it would become an annual event. The drive allows students and community members to drop off instruments that can be sold at a lower price or donated to younger elementary aged students. “I know that many people, especially myself, have lots of old instruments lying around their houses that other people can use. The Music Department in Farmington is exceptional, and I and so many others have gotten so much out of it, I wanted to be able to give the same opportunities that I have had to others,” Limaye said. By the end of the drive, Limaye and Imse received a total of 30 to 40 instruments. Music store owners Mike Seery of Seery Strings and Jim Martocchio of Martocchio Music volunteered to appraise and evaluate repairs of the donated instruments. The instruments will be given to students who have expressed a need in receiving one in the following months. that so many people in the community care about the future of the music program,” senior Hannah Clark said. The project will continue in the coming years, and Limaye hopes to gain more participation in the community through further communication with people in town, while also expanding the amount of publicity. They seek to aid other towns in the surrounding areas.